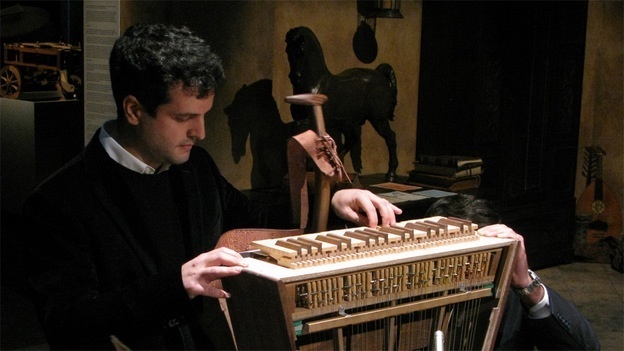 Edoardo Zanon built and plays the first modern harpsichord-viola, based on the designs of Leonardo da Vinci. December 10, 2009 - More than 500 years ago, Leonardo da Vinci designed a completely new musical instrument. But the harpsichord-viola was just a figment of the his imagination until now. Industrial designers from Italian firm Leonardo3 have reconstructed the instrument from sketches in Leonardo's notebooks. There's a slight problem, though: The mind of the great renaissance genius didn't count on how noisy the machine would sound. The premiere of the harpsichord-viola was part of the exhibit Leonardo da Vinci's Workshop at the Discovery Times Square Exposition in New York. The master's fabulous inventions are intricately re-created in models and working replicas. But until last week, the instrument glimpsed in da Vinci's Codex Atlanticus had never been played. Early music fans assembled in the exhibit for the world premiere of the harpsichord-viola, flanked by the Piffaro Renaissance Band. Christa Patton, who plays harp in the band, says she was amazed by the new instrument's beauty during practice. "I think the sound of the [harpsichord] viola is very revealing because it's very sweet and that's the sound he had in his ears." The harpsichord-viola is about the size of a child's toy piano. It weighs 33 pounds and straps to the musician's chest. It's unlike anything else in the orchestra. It has the strings of a violin but is played with a keyboard, and it's powered by the musician's legs as he walks. Before the first performance, the designers were trying to tune the strings — which isn't easy, because it's built with the materials that Leonardo would have had on hand, including wooden pegs and gears run by twine. Massimiliano Lisa, the CEO of Leonardo3, pointed out how the design is exactly like the rough sketch from 1488. "The thing that made it very difficult to make this interpretation and probably prevented other scholars from doing it is that the left part of the page is missing," Lisa says. In the fragment that remains, you can see that the instrument has a harness. So the designers figured it was invented as a way to play a stringed instrument while marching. The leg pumps a wooden motor, which moves a long loop of horsehair through the instrument. When the player presses the keys, the strings move up against the loop. Edoardo Zanon of Leonardo3 has been working on the re-creation on and off for five years. He heard it playing for the first time last week and found out why Leonardo might have abandoned the instrument: The wooden motor and gears make a clacking, grinding sound. Only after you get used to the racket can you hear the tones of the strings. "It's just the limitation of the technology at the time," Lisa says. But somehow, when the harpsichord-viola was surrounded by the ensemble, the noise became part of the piece. Patton, playing along on the harp, said she thinks it disappears like the hiss on an old record. "After a while, I find that I don't hear all the noise of mechanism and I'm satisfied with the sweet sound," Patton says. "Like the sound of the inventor's mind working while the music is going on."